For Greg and Sue, the move to Marlborough was a classic lifestyle change after careers spent in finance and marketing. For Simon, the motivation was the pursuit of quality winemaking without compromise. When it comes to crafting great wine, Whitehaven combine the precision of a scientific approach with the creative flair of an artisanal team, the crossover between science and art. Using new world techniques and old world craftsmanship, the team are focused on a portfolio of wines that deliver an enviable mix of quality, intensity and consistency. Acutely aware that great wines depend on premium grapes, Whitehaven sources its fruit from over 30 carefully selected and proven vineyard sites spread throughout the various valleys of this special region. Whitehaven prides itself on its use of Marlborough grapes only and this policy guarantees that its wines deliver authentic Marlborough flavours. 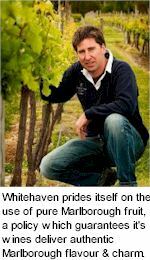 It’s a claim few wineries can match today and reinforces Whitehaven’s reputation for consistency and integrity. Marlborough is the heartland of New Zealand winemaking and is now widely recognised as one of the world’s iconic grape growing regions. With long sunshine hours, but a relatively cool climate, the grapes have the advantage of a long, slow ripening period which intensifies the flavours and gives the wine its unique character. Located in Marlborough’s golden mile of wine production, Whitehaven’s modern winery produces the full range of Marlborough wines including Sauvignon Blanc, Chardonnay, Gewürztraminer, Pinot Gris, Riesling, Pinot Noir and Rose. Whitehaven are a closely knit team who have supported the company from the early days, it keeps the company real. Each vintage a special batch of the very best wine is carefully selected to carry the Greg name, dedicated to the memory of Greg White. While Whitehaven has grown well beyond the expectations of its founders, the management, winemakers and viticulture team remain small and focused, working in an environment where their talents can be combined to produce elegant wines of superior quality and intensity, truly indicative of the Marlborough style. Whitehaven prides itself on a genuinely singular vision, consistently creating stunning wines of character and beauty from only the finest fruit. Whitehaven's vintages truly reflect the nature and spirit of Marlborough.